The Peerless Power of Comics! : Escape From Hades! Aside from the fact that one of their members is an Olympian demigod, the mighty Avengers' dealings with the denizens of Olympus have been few and far between. 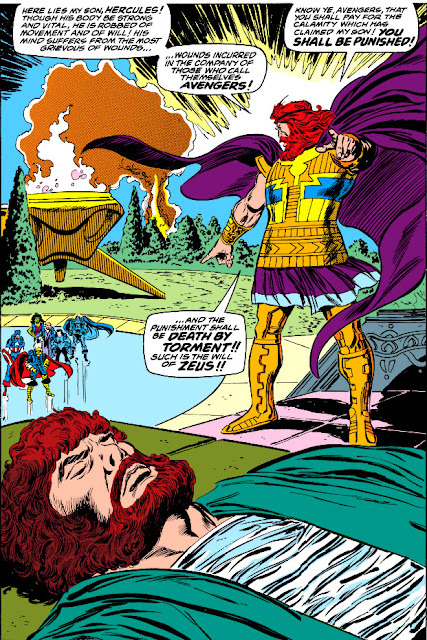 But when Hercules had the misfortune of being critically injured by the Masters of Evil, the Avengers were forced to confront the mystery of his abduction from his hospital bed--and as Thor soon discovered, all signs pointed to the Olympians. 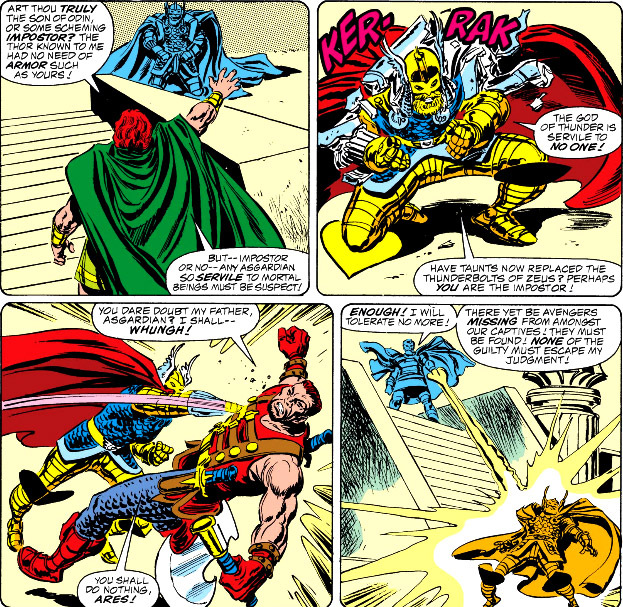 Of course, there's little reason for Thor to become alarmed, if that was the case; the assumption could easily be made that the Olympians became aware of Hercules' state and retrieved him in order to better treat his injuries. 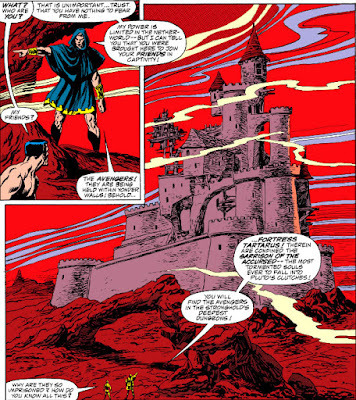 However, writer Roger Stern instead puts the notion into Thor to investigate, at which point the Thunder God subsequently leaves his teammates behind to transport himself to Olympus in search of Hermes, the Olympian he has spotted fleeing the scene. 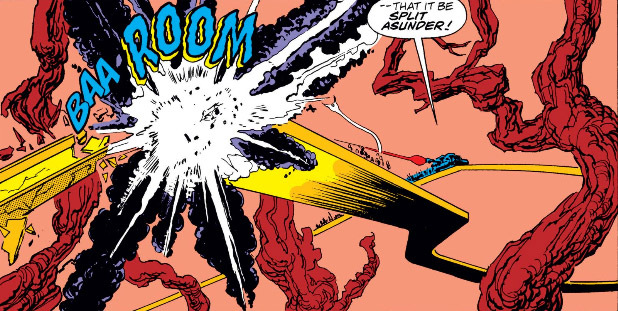 And while we readers are probably wanting to ask Thor, "Where's the fire? ", Stern uses the incident as a jumping-off point to a major story that would bring down on the Avengers the retribution of Zeus for their perceived wrongdoings against his son. 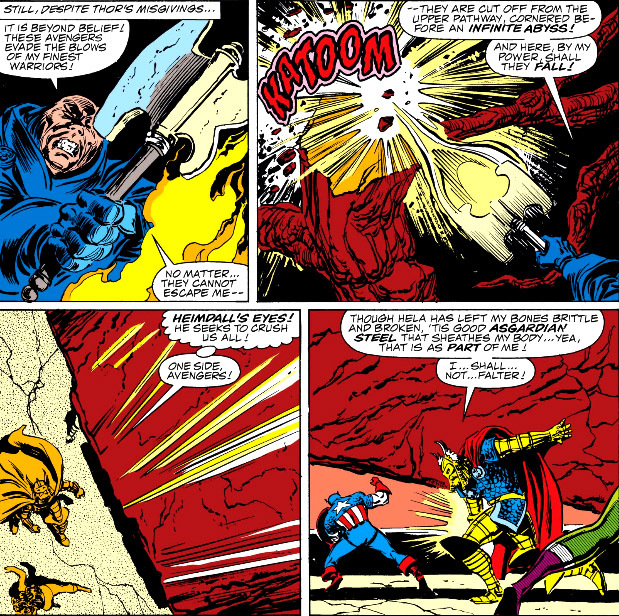 Following Thor's disappearance, the remaining Avengers are attacked on the streets of New York by a strike team of other Olympians who have been dispatched by Zeus to collar those Avengers whom he believes bear responsibility for the fate of Hercules--a directive which also includes inactive members the Wasp and the Sub-Mariner, who will be targeted immediately after the active members are retrieved. The team proves no match for the resilience of their foes--and soon enough, the Avengers awaken and find themselves the subjects of a deafening judgment. Hercules had suffered significant brain trauma as a result of the Masters' attack, so we can assume that Zeus's fury likely stems from the incoherent mumbling of recent events uttered in his son's delirium. The Avengers try to get a word in edgewise and provide the facts--but Zeus is fit to be tied, and judging by his demeanor he's already made his decision as to their guilt, and their fate. 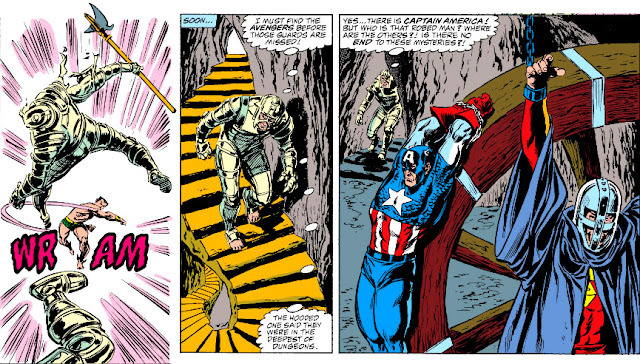 As to where the Avengers have been banished, we find the answer when we join Namor, who has successfully been captured as well but has managed to escape--with the mysterious help of another Olympian, Prometheus, who points the way to where the Avengers are incarcerated. Though one could make the argument that Hades itself is prison enough. Following his infiltration of the edifice, Namor soon comes across the sorry state of his comrades, imprisoned in ways that neutralize their abilities and verbally abused by their captors. Namor wastes no time in freeing them--and through clever means, taking full advantage of the elements of surprise and confusion. And so the Avengers learn of the fate for them decided by Zeus: consignment to Hades, the deadly netherworld under the rule of its lord and master, Pluto. And though the team has dealt with the contingent of armed soldiers guarding them, upon exiting Tartarus they encounter the first wave of the savage hordes that Pluto commands. while, above, the battle for their very survival awaits. We know from a 1966 story that Thor once successfully fought the legions of the netherworld in order to liberate Hercules from the contract with Pluto he was manipulated into affixing his seal to. But while the Avengers' first order of business is to locate and free Thor, his might added to theirs isn't the swift path to victory we might presume it would be, given that he suffers from a curse inflicted by Hela, the Asgardian Goddess of Death, causing his strength and battle effectiveness to deteriorate with every injury he suffers in combat--a fact that he hasn't yet disclosed to his teammates. Nevertheless, the Avengers fight their way to Thor's side--and when he fully reveals his handicap to them, in a way it serves to unite them all the more strongly in common cause. Of course, the major hurdle to clear in the Avengers' path to Olympus is Pluto--a fact that their leader, Captain Marvel, is well aware of as he challenges their attempt to escape. She does the unexpected, in Pluto's eyes--but once they're in the clear, if only for the time being, their flight only incenses their jailer and spurs him to make an all-out effort to recapture them. Meanwhile, the Avengers reach the Pathway of Infinity, which separates Hades from Olympus. But before they can make a break for it, Pluto has already marshalled his forces and makes a preemptive strike that could strand the Avengers in Hades for all eternity. 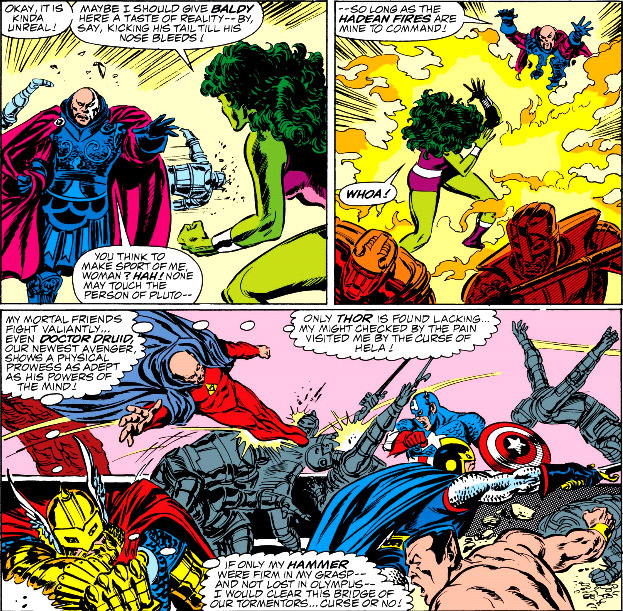 The act effectively backs the Avengers into a corner (or in this case, the edge of an abyss)--but it rallies the team into hurling themselves into battle against the unliving hordes of Pluto, resistance the likes of which even their foes have seldom seen. The odds against the Avengers must be staggering--but what of it? Ironically, it's Pluto himself who delivers the Avengers to freedom--thanks to Thor, who uses Pluto's blunder to the team's advantage, and to Captain Marvel, who seizes the opportunity to get her team out of the line of fire and to relative safety. 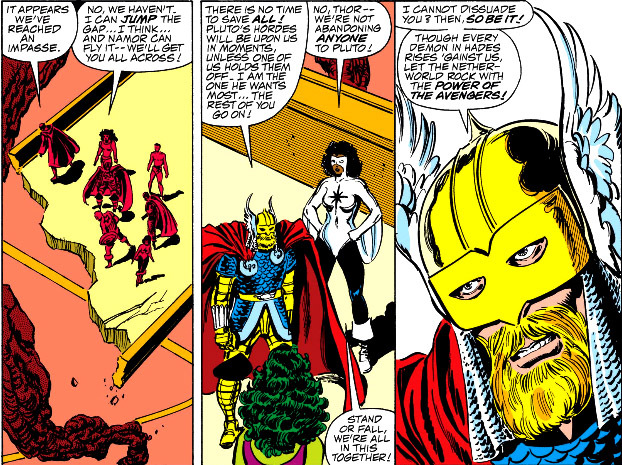 And you can imagine what form the dangers Thor speaks of will ultimately take--a meeting which pushes the Avengers to their breaking point, and paves the way for a two-issue conclusion to this story which will rock even Mount Olympus to its foundation. Just keep in mind that Zeus has also reached his breaking point. That's some rollicking good stuff! The "Hela's Curse" period for Thor was a rough and tense time for the Thunder God. Loved it. The only aspect I found plain goofy was how every hero, villain and now Zeus was thrown for a loop by the new armour. Red cape, winged helmet, same overall colour scheme and carrying Mjolnir. No, I just cannot figure out who this guy is!! Rivals Clark Kent's glasses for best superhero disguise ever. I think that Zeus may have said it best himself, Murray--Thor, to his peers and others, has never been known to have the need or desire for wearing a suit of armor, and so he could have indeed been a "scheming impostor," for all anyone who has had little to no contact with him knows. 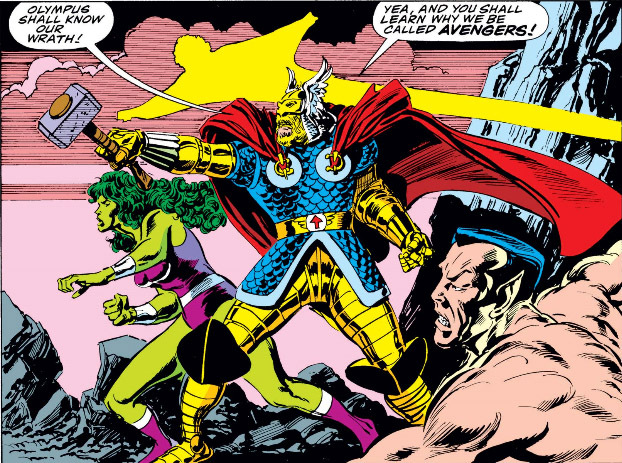 In addition, the fact that he was working with the Avengers was likely in itself sufficient reason for Zeus to have cause to doubt him--or, at the very least, to consider his motives suspect. It is a testament to how great Marvel was in the 80s that a story this great is more or less forgotten. Beyond the great story, there is so much structurally that I miss. They were able to seamlessly transition from Under Siege to another major story without three months of down time. They are able to reference what was happening in Thor's solo title without making it an all out cross over. If Under Siege or Assault on Olympus were written today, they would be three month crossovers that held the entire MU hostage with crossovers. This story is also the end of an era as it's the last great Avengers story before decade long slump in quality. Marvel has traditionally used the Norse God's as major characters and left the Greek gods to DC for Wonder Woman and Shazam. This is probably the best Marvel treatment of the Gods of Olympus. You know, Jared, I never stopped to think that there actually is a dearth of Olympian characters in Marvel stories, at least in comparison to the Asgardians--probably due to the reason you mention. We do see a good bit of Hercules (or, rather, "Heracles," if we're still referring to Grecian deities)--and of course Ares has been prominent as well, with Venus substituting for her Olympian counterpart, Aphrodite. Add to the list Pluto--another example of Marvel using Roman gods to populate Olympus, while using his Grecian counterpart's name (Hades) as the designation of his realm.